The beloved Bishop Joseph Cistone, 69, passed away in his home Tuesday, October 16, 2018. He was Bishop of the Catholic Diocese of Saginaw. It was announced in February that he was diagnosed with lung cancer. The diocese has since said his cancer had spread to other areas of his body. The diocese has released the following statement on Oct. 16: "The Most Rev. Joseph R. Cistone, Bishop of Saginaw, died in his home during the night. He had been scheduled for a medical procedure today to relieve the symptoms of lung cancer." The diocese said Cistone died of natural causes. A funeral mass will be held on Tuesday, Oct. 23 at 11 a.m. at the Cathedral of Mary of the Assumption, 615 Hoyt Ave. in Saginaw. 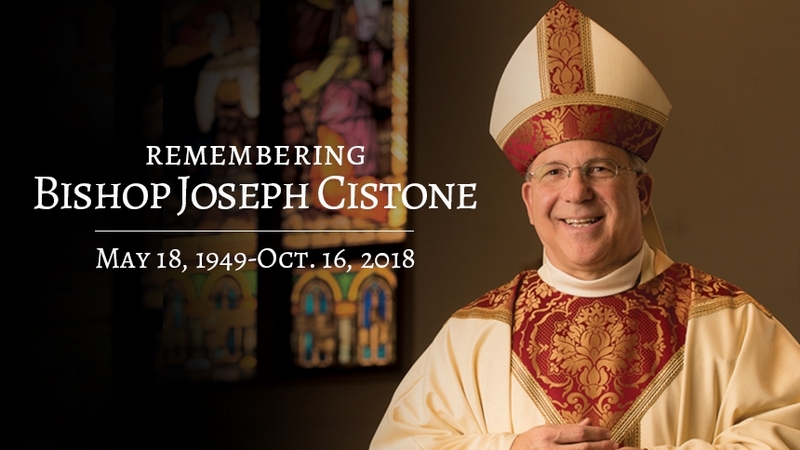 Visitation will take place at the cathedral on Sunday, Oct. 21 from 2 p.m. until 8 p.m. and Monday, Oct. 22 from 9 a.m. to 8 p.m.
Born on May 18, 1949, Joseph Robert Cistone was the second of three sons born to Josephine R. (Altomare) and Daniel A. Cistone, Sr. He was baptized and grew up in the close-knit Italian parish community of Our Lady of Consolation in Philadelphia. He received his elementary education from his parish school and later graduated in 1967 from Father Judge High School for Boys. That same year, he entered Saint Charles Borromeo Seminary in Overbrook, Pa., where he earned his Bachelor’s degree in philosophy in 1971 and Master’s of Divinity in 1975. Bishop Cistone was ordained to the priesthood on May 17, 1975, by John Cardinal Krol for the Archdiocese of Philadelphia. On June 8, 2004, Pope (now Saint) John Paul II appointed then Monsignor Cistone to become an Auxiliary Bishop for the Archdiocese of Philadelphia. Bishop Cistone chose for his episcopal motto a phrase from his daily devotion to Philadelphia’s Saint John Neumann: Father of Mercy and Love. Soon after his arrival in Saginaw, parish leadership called upon Bishop Cistone to address the need for parish restructuring. In 2011, as part of an overall plan to strengthen the Church of Saginaw and position parishes to better engage in the work of evangelization, Bishop Cistone announced the historic undertaking, Planning Tomorrow’s Parishes. The strategic planning process designed to engage parishioners to assess the state of churches across the 11-county Diocese of Saginaw and develop recommendations to enhance the vibrancy of parish life led to Bishop Cistone’s decisions in January 2013 to restructure parish communities and designate use of churches to better serve the faithful. Bishop Cistone continues to encourage the faithful to trust in the Lord’s plan, a message he first shared in his pastoral letter, A Future Full of Hope, in 2011. In it, he shares his vision for a complete revitalization of the diocese, which includes a commitment to evangelization, vocations, lifelong discipleship and promotion of a deeper love, appreciation and understanding of the gift of the Lord Jesus Christ in the Eucharist. Bishop Cistone enjoys spending time among the people, providing public witness to the Good News of Jesus Christ as he celebrates Mass, leads Holy Hours, administers the Sacrament of Confirmation, particularly to the youth, travels with pilgrims to the March for Life in Washington, D.C., hosts guests at the Bishop’s Ball and Golf Classic, prays outside the abortion clinic, ministers to migrant workers, speaks at community events, visits Catholic schools and much more across the Diocese of Saginaw. In addition to his many commitments within the diocese, Bishop Cistone serves as a member of the Board of Directors for Catholic Relief Services, and has traveled to El Salvador and Ethiopia on the organization’s behalf. He also serves in leadership positions on the national and state levels for the United States Conference of Catholic Bishops and the Michigan Catholic Conference.